Joyce Simpson, age 88 years, of Franklin Township, Hunterdon County, NJ, died on Monday, October 10, 2016 at her home. Born in Lewiston, ME, March 2, 1928, she was the daughter of the late Milton and Lola Dunn Lyon. Joyce was a retired Occupational Therapist, who worked for many years at the Hunterdon Medical Center. Joyce was also a professional watercolor artist whose watercolor paintings have been shown at various venues including the Garden State Watercolor Shows; Hunterdon County Art Center; New Jersey State Art Show; Gallery 33; Golden Talents Gallery; and Hunterdon County Library. A graduate of Bates College in Maine, she was a founder and President for three years of the Hunterdon Watercolor Society and was also an associate member of the Garden State Watercolor Society. In addition, Joyce was a former member of the Franklin Township Board of Education. 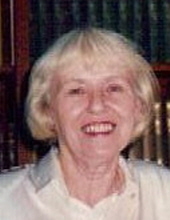 Her husband, Albert William Simpson, Jr., died in 2009. Surviving are four sons, James B. Simpson, Kenneth L. Simpson, Steven M. Simpson, and Richard B. Simpson; a daughter, Patricia Simpson Webster ; two sisters, Judy Hatch and Carol Wagg; and six grandchildren: Claire, Joseph, Charles, Kate, Julia, and Natalie. A Memorial Service will be held Sunday, November 13, 2016, at 10:00AM in the Holcombe-Fisher Funeral Home, 147 Main Street, Flemington, NJ. Interment will be private. Memorial contributions may be made to Hunterdon Watercolor Society, c/o Eleanor Eick, 701 Springhouse Drive, Whitehouse Station, NJ 08889. "Email Address" would like to share the life celebration of Joyce L. Simpson. Click on the "link" to go to share a favorite memory or leave a condolence message for the family.